www.marinelink.com 49 ist Brie Knox, boarded the AN-2 and zipped across the water. Joshua Vaughan, ULL assistant professor of me- chanical engineering, piloted the vessel from his iPad. Vaughan, along with mechanical engineering grad students Nicholas Bergeron and Brett Marks, are part of the unmanned system’s development team. They’re working with lasers, cameras, ultra-sound and other sensors that gauge currents and waves to detect obsta- cles like logs in the water and oncoming boats. That information will fl ow to a computer system that steers and accelerates the AN-2, mimicking the activities of a human pilot. The fi rst two phases are early in the project. “Com- plexity increases exponentially after that,” Vaughan said. “Personnel and funding will need to increase as well.” In Phase 3 and beyond, “some primary goals include extending the autonomy developed in Phase 2 to include speeds approaching the limits of the Ana- conda,” Vaughan said. Researchers will work on more complex trajectories than in Phase 2 and will address obstacle avoidance and high winds. Also in Phase 3, researchers plan to extend the ves- sel’s remote operational distance by improving com- munication with the boat. They intend to refi ne the boat’s unmanned navigation system, using maritime and waterway standards, so that the craft recognizes buoys, signal fl ags and other warnings and reacts to them. Other steps in the AN-2’s development include deriving the boat’s governing equations of motion; implementing sensor processing al- gorithms; and software testing, Vaughan said. Ramesh Kolluru, ULL interim vice president for research, said the public-private partnership between Swiftships and the university will pro- duce a number of benefi ts. The AN-2 gives un- dergrads and graduate students hands-on train- ing, and Swiftships and ULL together will train workers on the Anaconda, contributing to labor force development, he said. Eric Geibel, Swiftships special programs di- rector, said autonomous piloting has broad im- plications for the marine industry and noted that the company’s vessels are always on the fore- front of technology. The Anaconda can operate in air temperatures above 100 degrees Fahrenheit. With fi ve weap- ons stations and a foam-fi lled structure, the ves- sel can engage in riverine warfare and remain afl oat, even if it’s pierced. The craft has an ad- vanced-design bow ramp for cargo or personnel, collapsible seating, an optional trailer and truck; and can be helicopter lifted. It’s unknown when the AN-2 will be market-ready but last year Swiftships and ULL had a three-to-fi ve- year framework for its completion. 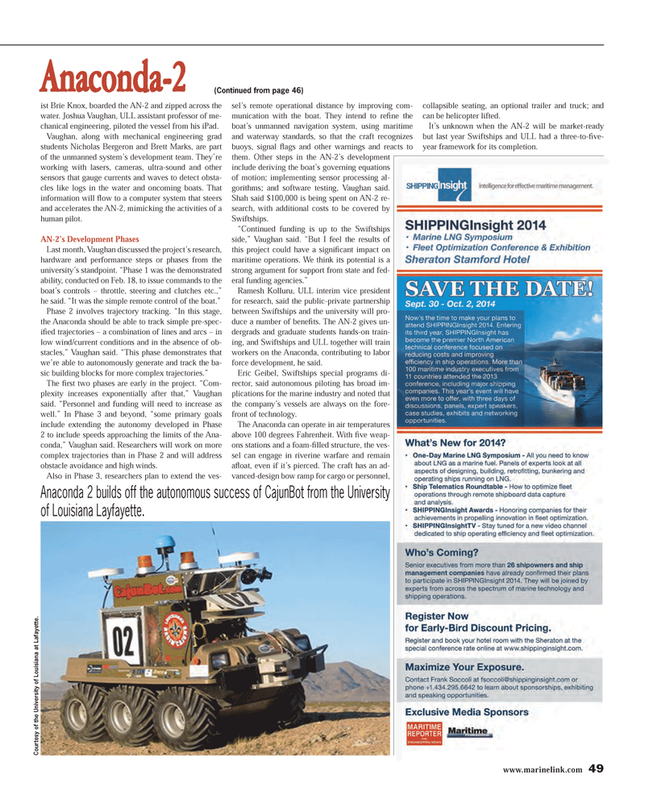 Anaconda 2 builds off the autonomous success of CajunBot from the University of Louisiana Layfayette. Cour tesy of the University of Louisiana at Lafayette.